The gentle thud of magazine on carpet is always welcome, even to someone burdened with 3 more subscriptions than can be comfortably consumed in a single month. I feel pretty solitary in thinking that print isn’t wholly dead in the water, but then the latest issue of Empire has me worried at quite how desperately they seem to be clutching at straws these days. FIRST LOOK: HEROES OF 2010! could easily pass muster as an Italian sci-fi film from the 1970’s, but Public Enemies aside it’s the number one feature of month. Ridley Scott’s will-they-won’t-they Robin Hood gets top billing, giving the unwitting punter at the newsstand a sneak-peak at Aussie Gruff-Man Russell Crowe cutting a haggard profile as the Robenhood himself. All fine and well, I’ve already seen that picture on the internet, so what other sneaky peaks lie in store I wonder? Well it’s that picture of Russell Crowe again. But reversed this time. Much like the closely studied Seagal, Crowe qualifies in that class of action hero whose face is strikingly symmetrical, making image reversing an absolute doddle. A page editor’s dream! And all credit to the brief article, it provides short snippets of insight from the film’s scriptwriter Brian Helgeland, setting straight the record on some of the stranger rumours that have been doing the rounds on this here internet. Crowe won’t be playing both Robin and the Sheriff of Nottingham. No mullets. No swinging on ropes either. Pretty promising relative to the standard set by Kevin Costner and his rusty spoon. Giving no disrespect to Mr Helgeland, I’m guessing the face of a scriptwriter doesn’t cut much muster with the celebrity hungry Empire magazine. But alas, alack! The studio’s only drip fed poor Empire a single image of Robin, which they’ve already had to flip for the cover and the article! What to do! And off the illustrator goes and does exactly that. Using that very same solitary photo as source material. Amazing what you can do with a bit of paint and tracing paper really. So I had the mis/fortune of catching Steven Seagal’s gut-wrenchingly awful Attack Force on Five the other night. Rarely could I conceive that such an incompete film could ever be launched on the world, but sure enough, there it was on terrestial TV. Someone at Five must have a fine sense of humour and some deep pockets. How the film could be quite so spectacularly broken demanded a bit of research, and it turns out that Mr Seagal himself is at the crux of the films failure. The plot was apparrently cut to shreds as the budget inflated and collapsed as financiers came and went. What should have been a film about alien invasions settled on merely being about vampires. Cheaper to just buy fangs and black contact lenses than bother with full blown CGI. And Underworld has been making money out of that old rope, so why not spin that some more. With Seagal of course! What could possibly go wrong? Well warning signs came early on when Seagal’s character, Cmdr. Marshall Lawson, seemed to take on a voice of his own, like a man possessed. Only in a badly dubbed way. It turns out that Mr Seagal is very reluctant to take part in any of the post-production work on these direct-to-video films. Almost all films need some redubbing of poorly recorded scenes, and most actors are more than willing to oblige. Mr Seagal however is of the modern ‘take-the-money-and-run’ school of acting, and if it aint on the time sheet he aint bothering. 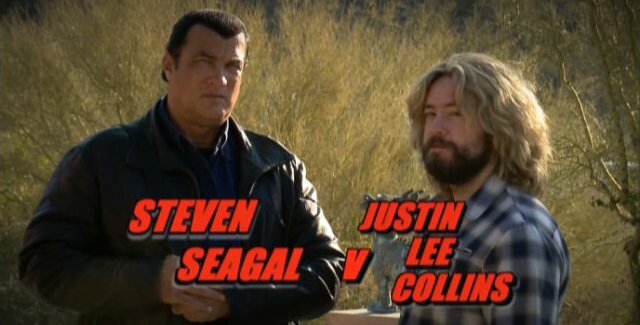 As such the production team is forced to hire someone else in to come and inpersonate Steven Seagal. Badly. It turns out this lack of co-operation extends to publicity work for these substandard DtV films. The consequence is that we are now priveleged with some of the worst examples of photoshopping to ever grace the covers of one actors’ recent ouevre. A turning point seems to be Seagal’s last major Hollywood film, Exit Wounds (2001) and that everything thereafter has just been a slippery slope down towards Attack Force. This is just the tip of the iceberg, stay tuned for more soon.